KUALA LUMPUR, Malaysia, September 6, 2011 (ENS) – Nearly 700 elephant tusks stuffed in gunny sacks and marked “recycled craft plastic” were confiscated Friday by Malaysian Customs officials at Port Klang in the state of Selangor. Officials of the Selangor Customs Department seized the shipment following a tip from their Penang counterparts, said Datuk Zainul Abidin Taib, Royal Malaysia Customs Department assistant director-general of enforcement, at a news conference. 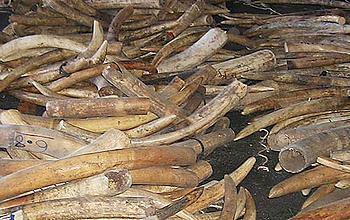 The 695 tusks seized weighed about 2,000 kilograms (two metric tonnes). The shipment originated in Tanzania and was destined for China, said Zainul. The tusks were packed and hidden in the same manner as another shipment of tusks seized August 19 in Penang, he said, suggesting that the same smuggling syndicate was responsible in both cases. The 664 African elephant tusks seized in Penang were hidden in a container from the United Arab Emirates. The 1.5 tonne seizure, declared as “used plastics,” was made at the Butterworth Port, in the northwest of peninsular Malaysia. In an earlier seizure on July 8, the Wildlife and National Parks Department and Customs Department seized a container of 405 African elephant tusks declared as plywood at the Malaysia’s Pasir Gudang Port, in the southernmost state of Johor. To date, no arrests have been made, but Zainul said investigations into all cases will continue. Because Malaysian ports handle millions of containers each year, inspection of them all is impossible and only those identified by a tip are examined. Commenting on the latest seizure, Zainul said it would not have been possible without information from the public. “We hope the public will continue to co-operate with Customs and provide us with timely information,” he told the Southeast Asia branch of TRAFFIC, the international wildlife traffic monitoring organization. “This latest in a series of major ivory seizures in Malaysia is both heartening and disappointing,” said TRAFFIC Southeast Asia Regional Director Dr. William Schaedla. Schaedla congratulated the Customs Department on the successful seizures and urged continued vigilance in Malaysia and across the region. Friday’s ivory seizure was the fourth in 14 days directly linked to Malaysia; Customs officials in Malaysia, Hong Kong and Tanzania have confiscated a total of 3,194 elephant tusks in the four seizures. On August 19, a China-bound shipment from Tanzania was seized in Malaysia with 664 elephant tusks. On August 23, 1041 elephant tusks bound for Malaysia were seized on the Tanzanian island of Zanzibar. Two suspects were interrogated in the ongoing investigation. 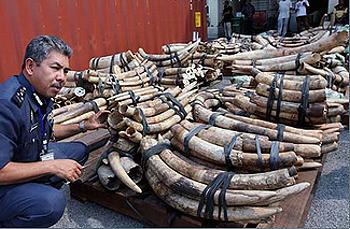 Last week, officials in Hong Kong seized 794 African elephant tusks on a shipment from Malaysia. A suspect was arrested and the investigation is ongoing. On September 2, officials in Malaysia seized 695 elephant tusks shipped in from Tanzania, bound for China. A fifth seizure of 405 tusks on July 8 at Pasir Gudang Port brings to 3,599 the total of tusks confiscated over the past two months linked to Malaysia – representing an estimated 1,800 elephants killed for their ivory. The International Fund for Animal Welfare applauded the achievements of the Malaysian and other Customs authorities but warned that the flow of illegal ivory will continue as long as prices for ivory in China remain above those seen during the elephant poaching crises of the 1970s and ’80s. “Looking at the thousands of elephant tusks seized in the last couple of weeks we must immediately ask ourselves how many tusks are slipping through the net?” said Kelvin Alie, IFAW’s program director for wildlife trade. “It seems clear that Malaysia has become a major transit point in the ivory trade but there are numerous other transit points such as Singapore or Vietnam that link the African range states being devastated by poaching with the seemingly insatiable demand of China,” Alie said. “In the end we must have a complete ban on international ivory trade to try and stop the losses amongst our elephant populations,” he said. In 1989, legal trade in African elephant ivory was halted by the Convention on International Trade in Endangered Species, CITES. Two legal sales of stockpiled ivory from elephants that died of natural causes have been allowed since then, but conservationists say the legal sales have masked illegal trading, which has skyrocketed since the last legal sale in 2009. According to media reports between 50,000 to 100,000 containers enter Malaysia’s ports every month and only those which are singled out via intelligence or tip-offs are inspected. International criminal syndicates, who often smuggle drugs, arms and other illegal goods, are known to be heavily involved in the trafficking of ivory and benefit from a lack of international coordination. “IFAW has funded Interpol’s Ecomessage award to encourage international cooperation in tackling this nefarious and multimillion-euro business that is devastating our ecosystem,” said Alie. The Interpol Ecomessage award is presented to the country or countries that have contributed the most to the international exchange of intelligence relating to environmental criminals. Botswana and Poland were recognized in 2010 for the value of their information and their consistency in submitting ecomessages.